Just work and young workers’ rights were at the forefront of the gathering of around fifty young workers and leaders of CAJ from various regions of Germany. They gathered together in Berlin from April 28 to May 1, 2017 to deepen their action campaign on “Precarious Work”. Three main demands under that theme were identified: the reduction of working time, basic income guarantee and gender equality at work and in the society. 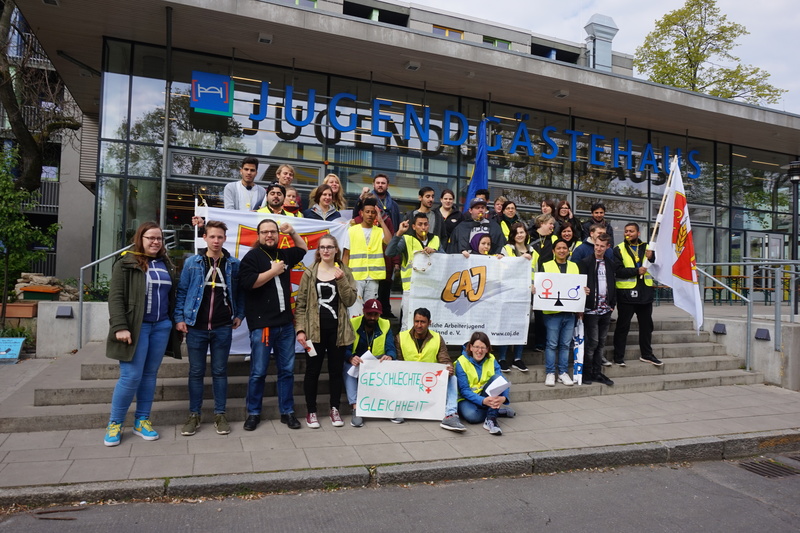 During the “Bundesaktionstage”, which was the name of the study days and the “March of Young Workers” organized in the framework of this grassroots event, young German workers, students, unemployed youth, migrants and refugees joined together in action. Over the 3 day-round table discussions, experts were invited to discuss some perspectives and proposals with the leaders. It will help young people to develop their own critical and analytical thinking as they carry out the YCW action campaign. The topics of the discussions included the Basic Income Guarantee (BIG), which would certainly reduce poverty and unequal distribution of wealth among German population. Today while more and more is being privatized because of capitalism, only those who have money can access services. The basic income guarantee is a safety net and also a right of all citizens to live decently and with dignity. Another topic was Gender Equality. This does not mean that women and men have “to be the same”, but they are entitled to equal rights, opportunities and responsibilities, and to a fair treatment according to their respective needs. We note, however, that in many cultures and societies, women remain vulnerable at work, at home and in society. Precarious employment is one challenge for many German youth. A lot of young workers in Germany work 40 hours a week, some work 2 to 4 hours a day, and the rest are unemployed. The reduction of working hours and sharing hours of work is a concept based on the idea that “less work for some people will create more work for others”. The campaign of CAJ Germany on Precarious Work began in 2012. It started with the gathering and analysis of data, the collection of young workers’ testimonies. Then to deepen the judge part, different action references was gathered, discussed, and published. 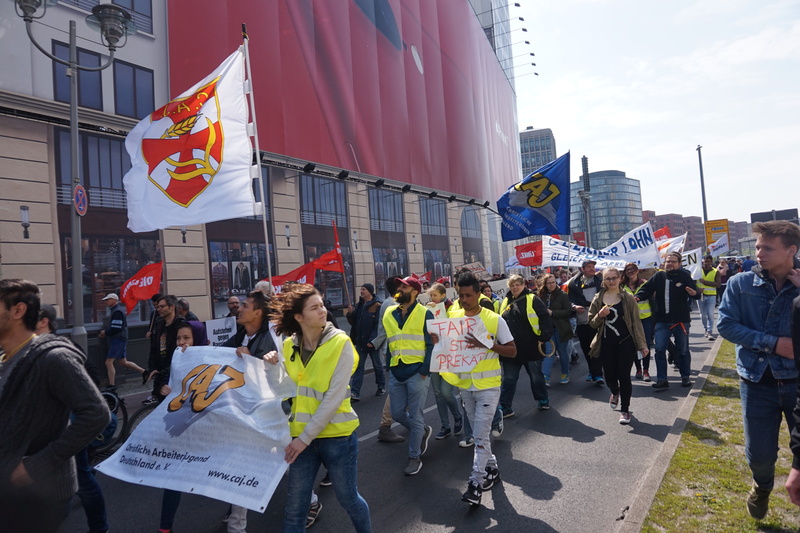 While the International Young Christian Workers around the world were celebrating the International Week of Young Workers, CAJ Germany organized the “Workers’ March to Berlin” on May 1, 2017, which was the highlight of the five-day activity. It was also the moment for CAJ-Germany to launch its campaign on Precarious Work. 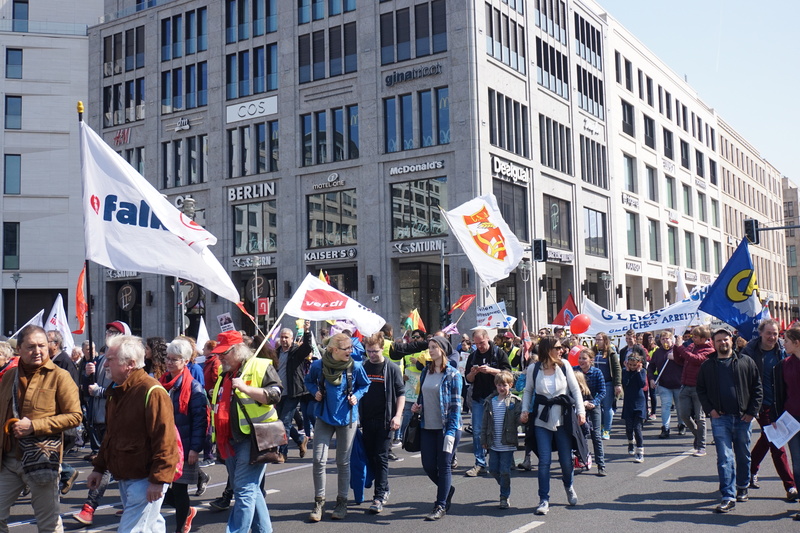 The YCW started marching from Alexanderplatz at 10:00 in the morning and merged with the larger crowd which was organized by the German Confederation of Trade Unions (Deutscher Gewerkschaftsbund, or DGB). There were around 25,000 people, which is considered to be one of the biggest gathering of workers so far this year. “It was a great experience for me to participate in such activity. I am a migrant here in Germany and I could feel the solidarity among German YCW and other organizations. As a YCW leader, I have the commitment to empower young women, because way back in Afghanistan, women have less rights and privileges than men...” said Fatima, one of the YCW migrant activists from Fulda, Germany. As a conclusion, Labor Day is not only a day of rest at work, but an opportunity for all workers and young workers to celebrate the achievements and empowerment of the working class, to claim their economic and social rights, and to continue the struggle for Just Work and Dignified Life for all Workers. Work-Free Sunday is a Right! Young Christian Workers Raise their Voice, Not Only On Women’s Day!